Come visit Westchester Community College Center for the Arts during our Ceramics Open House! 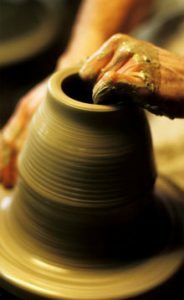 During the open house, you will have the opportunity to tour our facility with ceramic instructor Elizabeth Insogna. She will be available to talk about our numerous ceramic classes and answer any of your questions. Wheel throwing demonstrations will take place and all are welcome to try the wheel. If you have any questions, feel free to give us a call at 914-606-7500!